In the world of today, wrought copper and copper alloy products are playing a significant role in the development of technological innovation and new products for high technology industries such as electronics, semiconductors, automobiles, and electrical components. In the field of semiconductors, in particular, high precision components are being sought after along with the sophistication and diversification of needs. 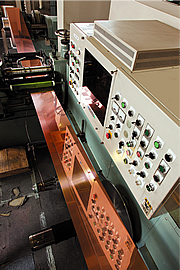 At Fugen Corporation, having installed a state-of-the-art automatic shearing machine (friction winding-type recoiler), the first of its kind in the Hokuriku region, we are meeting various demands both domestic and abroad, fully utilizing our expertise in the manufacture of semiconductor components. 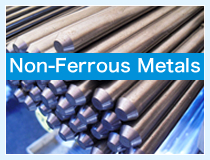 Against the backdrop of international demand our Non-Ferrous Metals Division covers a wide range of fields such as electronic components, automobiles, gas appliances, and faucet fittings. In July 2004, we obtained ISO 14001 certification. We are striving to bring to fruition a recycling society through all aspects of our activities, from the delivery of products to the recovery of materials, including the handling of environmentally friendly products such as cadmium-free and lead-free brass rods. Fugen Corporation, in response to user focus on the new era and to establish a rapider and wider-reaching logistics system, completed the Daimon Non-Ferrous Metal Distribution Center in 1996 to cover Toyama, Ishikawa and Fukui prefectures, in addition to the existing Joetsu Branch (Myoko City) whose main area is Niigata and Nagano prefectures. Then in 2010, the Osaka Sales Office was established to mainly cover the Kansai area. We are working at establishing essential distribution hubs, while further improving and enhancing each of them. Through their full-scale operations, the handling of non-ferrous metals and building materials has been clearly divided, allowing us to achieve even more efficient product management. Copyright (c) Fugen Corporation. All Rights Reserved.